LFI is an award winning full service luxury interior design firm specializing in high-end residential projects or those that have significant remodel scope. LFI provides comprehensive services from concept to move in (and everything in between). Known for her fresh, clean, chic and timeless look, Lisa is dedicated to her clients, has a relentless work ethic and is full of endless ideas and inspiration. “Personal, luxurious and livable” are the words that drive LFI’s designs. Lisa’s professional vision and ultimate goal is to produce not only an incredible space, but even more, one that fosters a lifestyle and tells the story of the people who live in the home. A collaborator at heart, Lisa kicks off each project by listening to the diverse and changing lifestyle needs of her clients, so that she may execute a design based on their unique perspective. Lisa is a lover of architecture and because of this, she approaches each new project with respect and consideration for the exterior of the home and its physical location. While each project is viewed as an opportunity for something bold, exciting and fresh, nothing is left to chance, and everything revolves around the underlying theme of luxurious simplicity with functionality first. When you engage LFI, Lisa rolls up her sleeves and does all of the critical design work personally. Lisa partners with her clients in what she believes to be a very personal experience and strives for a fun and exciting process. The design process is systematic, but is somewhat fluid as each client processes information differently. Lisa draws space plans, creates mood boards, and engages and educates clients throughout the process so that they fully understand what they are “getting”, and they are vested in the outcome. Once timelines are agreed upon, Lisa keeps the project on track. Above all else, Lisa is an advocate for her clients, most of whom become repeat customers, and often times great friends. 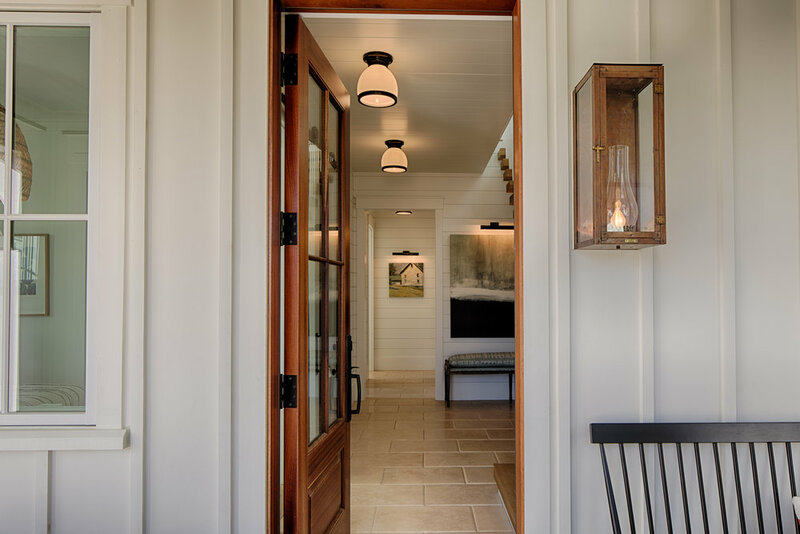 Lisa’s approach in creating practical, yet beautiful homes has earned numerous awards including Best of Houzz for Service and/or Design, every year since its inception in 2013. LFI was the international category winner in HGTV’s 2017 Faces of Design award, and is a vetted designer in Southern Living’s exclusive Designer Network. In 2017, Lisa was named as one of the Top 25 Pennsylvania Interior Designers by Luxe Pad. I credit my Grandmom, Jennie LaSpina, for the inspiration of the relaxed and simple, yet luxurious and chic designs that have become my trademark for over 15 years. I spent my childhood walking down oak tree covered sidewalks with Grandmom, picking up acorns and admiring all of the beautiful homes in her neighborhood. We would often talk about how a house would look so much “cuter” if it had a different paint color, a new front door, pretty window boxes, and so on. When we got tired of walking, we went home, she made me a milkshake, and I drew more houses at the kitchen table with a spiral bound tablet and a box of Crayolas (the BIG box, with the built in pencil sharpener)… then I “grew up”. After practicing divorce law for ten years, I needed to switch gears. I finally found my calling as a down to earth, “barefoot” designer, and became known for embracing all styles thru an easy does it, straightforward, and authentic approach. I have been beyond fortunate to have wonderful, longstanding clients who tell me that even more important than my solid credentials are my personal warmth and professionalism. I can’t say for certain where the professionalism came from, but I know the personal warmth came straight from my Grandmom. Jim Colton (JC) partners with Lisa to manage the business, with a focus on business operations. JC has more than 25 years of experience in helping companies improve their business and systems, primarily working as a consultant focusing on the customer experience. At LFI, JC works on improving business processes, order and delivery management, technology and billing; all with the ultimate goal of keeping clients happy. JC was born and raised in the Pittsburgh area, and has spent most of his adult life in the Philadelphia suburbs. He graduated from Penn State and went on to earn an MBA at the University of Maryland. Observing Lisa’s passion for her work, Jim has grown a great appreciation for architecture and interior design. Lisa and JC will soon celebrate their 11th anniversary. They divide their time between the Low Country of Bluffton, South Carolina and Bryn Mawr, Pennsylvania. They have three daughters, Taylor, Kelly and Lauren. Lisa and JC spend most of their free time with family and enjoying fun times with close friends.